Here is a savory muffin that is perfect for Thanksgiving dinner. This recipe is based on one from Gourmet magazine. Brush muffin cups with melted butter. Whisk together 2 cups cornmeal, 1 tsp. salt, 1 tsp. baking powder and ½ tsp. baking soda in a bowl. In another bowl, whisk together ¾ cup corn, 1 ¼ cups buttermilk, 1 egg, and 5 tablespoons of melted butter. Stir dry mixture into wet mixture. Add 1 1/2 cups shredded cheddar cheese. 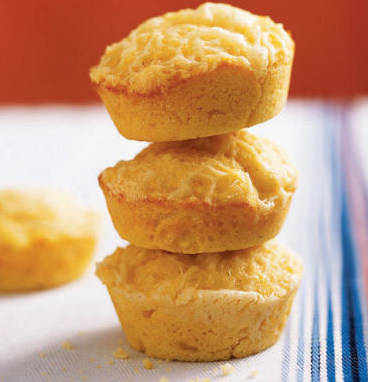 Pour mixture into muffin tins, and sprinkle with ¼ cup of cheese. Mix one stick of softened butter, 1 finely chopped jalapeño pepper and ¼ teaspoon salt. Serve with Cheddar Corn Muffins and ENJOY!! !